While there are a number of influences which have always been present in casino games and slots, it would be fair to say that ancient Egyptian mythology has been an ever present. The fame and fortunes of the Pharaohs and the mystery of the Pyramids and the Sphinx have provided a massive influence on game creators. Sphinx Hijinx is the latest game which draws on this influence but there are plenty of slots options to enjoy with this game, which is not solely reliant on its style and image to attract players. Even though there are many different types of slots to choose from, many players will always opt for the classic 3 reels and 1 payline slot. 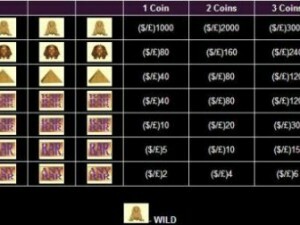 If this sounds like the ideal slots option for you, you will be delighted to hear that Sphinx Hiinx fits this criteria. This definitely a classic slots option and it should be the game that you are drawn to if you prefer the traditional style of slots. When making a wager you will note that you can place between 1 and 3 coins per spin and the value of the coin can vary between $0.01 and $5. This means at the highest level possible, the maximum bet available for the Sphinx Hijinx game is $15. Sphinx Hijinx is a classic slots game and is usually not offered in US online casinos, although similar kind of slots such as the Cleopatra slots collection are. Go wild with the Sphinx! There is a Wild Symbol in the game and you will not be surprised to learn that it is the Sphinx. The game does very in sticking to the overall theme and it provides a very simple theme and style for slots players. If you are looking for an extravagant slots game with lots of bells and whistles to distract you, this is not going to be the slots for you. However, if you are interested in a slots game that focuses on the reels and payline action without too much getting in the way, this will definitely be a game that will capture your interest. The game provides a maximum jackpotof $3,000 which is something that is worth playing for. It should be noted that the maximum amount is only paid out occasionally but it is always worth knowing what the other limits of a game and its pay-off are. Sphinx Hijinx is not a progressive jackpot slot which will please some people and disappoint others. There is no doubt that there is a lot of excitement and tension associated with playing for a massive progressive jackpot prize but most casino players are realistic enough to accept that they aren’t going to win this huge life changing sum of money. This is why playing games like Sphinx Hijinx provides a more realistic chance of winning. 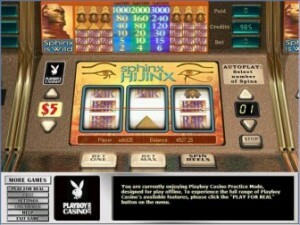 As far as classic slots go, the Sphinx Hijinx game is one that will appeal to a wide range of people. The style and look of the game ties in very well with the overall theme so Egyptian fans will be pleased. However, it is the simple and straightforward gameplay that is likely to be the biggest attraction about this game and it delivers strongly.